Correct analysis and identification of the performance of the Clothing Suiting Fabric and its accurate and reasonable application to the clothing design is the basic knowledge that every designer needs to master. Otherwise, the recognition of the Printing Fabric may lead to problems in the design, production, wearing or washing of the entire garment. The identification of apparel fabrics includes the identification of raw materials for apparel fabrics, the identification of appearance features, and the identification of appearance quality. Observing and identifying fabrics requires not only visual but also hearing, touch and even smell. For example, the visual effect of the eye is used to observe the gloss and darkness of the fabric, the dyeing condition, the surface thickness and the appearance characteristics of the texture, texture and fiber, such as the plain cotton gloss, the appearance is not fine enough, the rough and even the neps impurities, the wool and polyester blend. The woolen velvet is brighter and has a flashing color. The body bone is slightly hard and loses its softness, and it is prominent with the increase of polyester content. Lack of soft, soft feel, the fabric is crisp. It is smooth and smooth; the haptic effect of the hand can be used to feel the softness and hardness of the fabric and fiber, smoothness, thickness, elasticity, cold and warm, etc. The strength and elongation of the yarn in the fiber can also be measured by hand. Different fabrics have different breathability, hygroscopicity, warmth retention, etc. For example, cotton fabrics have good breathability and moisture absorption, comfortable wearing and good warmth, and are ideal children's wear fabrics. When selecting a fabric, you should confirm the fabric's breathability, heat retention, hygroscopicity, electrostatic properties, etc., and then consider what it is suitable for, such as the stiffness, weight, hardness and drapability of the fabric. Kinds of styles, etc. 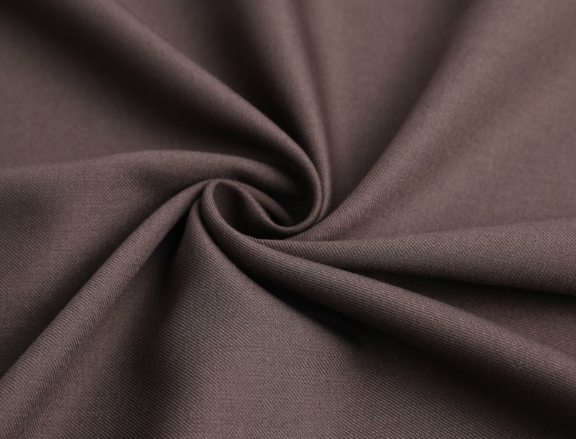 We have Polyester Wool Blend Suiting Fabric, TR Suiting Fabric and so can provide you, welcome advice and order.